Master of Disguise - Cobbler Wobbegongs! 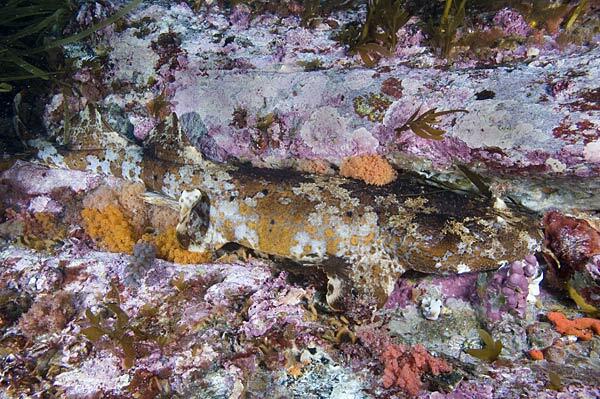 In southern Australia there’s a secretive little shark called the Cobbler wobbegong. Like most wobbies it is exquisitely painted in vibrant oranges and browns that form saddles along the length of its body and tail. Between these richly colored bands lie complex patterns of dark and pale spots that serve to break up its overall shape, rendering it invisible to passing fish. Unlike other wobbies the Cobbler’s back is also covered with strange wart-like tubercles that further obscure its silhouette. According to the experts, the Cobbler wobbegong (Sutorectus tentaculatus) is a common inhabitant of inshore southern reefs. In reality however, you need super human vision to spot one. Not content with blending perfectly into the sponges and rocks, cobbler wobbies like to hide under dense mats of kelp. Because they’re so hard to spot I have been looking for a cobbler to photograph for a long time and when I finally found one it was completely unexpected. Technically, I was searching for Leafy sea dragons (yep, I know they’re not sharks). I was diving in Bremer Bay; a small fishing village fringing the restless southern ocean. It is a six hour drive south of the remotest city in the world so it doesn’t see many fishermen (or divers) which is good news for the legions of exotic species of fish that still flourish on its surge pounded reefs. I was floating along in the surge with my face about six inches above the kelp. This is quite disorienting after a while and I wouldn’t recommend it if you’re prone to sea sickness. The whole reef canopy was swaying back and forth queasily as the incoming rollers swept towards shore. As the kelp went one way, I kicked the other and inadvertently caught a fleeting glimpse of a camouflaged fin waving in time with the rest of the reef. I immediately set aside all thoughts of Sea Dragons. I woke up my Nikon and tweaked it into ‘shark mode’ then I anchored myself to the seabed and tried to brush the kelp away long enough to get a good look at the shark. On the next gust of surge I spotted the telltale bumpy skin and realized that I was staring at my first Cobbler wobbegong – cool! I get the same rush from seeing a new wobbegong as most divers would get from seeing their first great white shark. I backed off a little and thought about how to compose a shot. It wouldn’t be easy with all that foliage covering its body. I tentatively snipped off a few fronds (kelp grows back really fast) and waited to see if the wobby would bolt. It was wedged securely under a ledge and made no move to flee. So, reassured, I continued ‘gardening’ until I’d cleared enough space to see it’s whole torso. What slowly materialized was a beautiful 3ft long female. 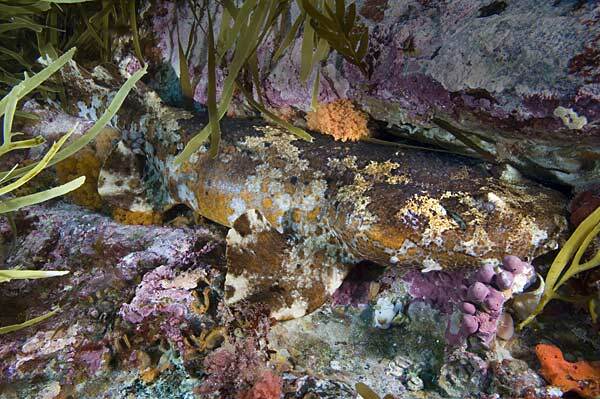 Her colors and markings were the most striking of any wobbegong I have ever seen. She waited patiently while I composed frame after frame, regarding me through serpentine, gold flecked eyes. Protruding from her chin were extremely long and slender barbells but she lacked the wobbegong-like branching skin flaps that are characteristic of most species. Satisfied with my images, I remained on the seabed clutching clumsily at the rocks through my thick dry-gloves. I wanted to absorb as much as I could about this animal, figuring that I was unlikely to see another Cobbler wobbegong any time soon. It occurred to me that she was probably a full grown adult. Some wobbegong species can reach three meters in length but Cobblers rarely exceed one. Sadly, wobbegongs are seriously over-fished in Australian waters. It is likely that the Cobbler’s unprofitably small size is one of the reasons that it has continued to thrive, while its larger, more lucrative cousins have been dangerously depleted. Surprised by an unusually strong surge, I was swept against the wobbie’s resting place. As I tumbled over it, I thought that this added harassment would be the final straw that caused the wobbegong to swim away, but it didn’t move a muscle, relying on its instinct to ‘become one with the reef’ rather than draw attention to itself. I would have liked to stay and play with this unusual shark all day, but already feeling way too invasive, and not wanting to cause the shark any more distress, I backed off and let the surge pull me away. The ocean has been good to me. This was one more awesome, unexpected treat and one more wobbegong ticked off my list. That makes six. Three more left to shoot in Australia and one more species in Japan. Hmm, Japan where the cold North Pacific crashes into the tropics. Home to goblin sharks and who knows what else. Now there’s an adventure!